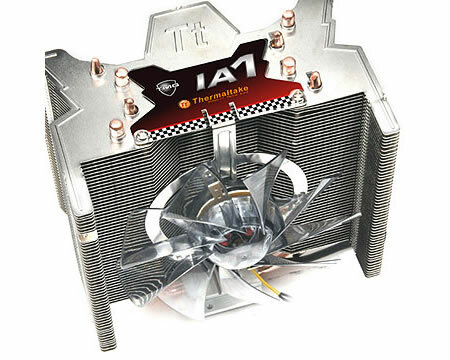 The new Thermaltake CPU cooler- TMG IA1 definitely can satisfy PC DIY users and gamers’ different needs. Thermaltake TMG IA1 CPU Cooler is equipped with a 12cm Scurve fan with blue LED. This giant fan’s powerful air flow guarantees the CPU can work normally while the user’s PC is on multi tasks. 4 copper heat pipes and large surface fin can maximize the heat dissipation speed. The copper base is also tempting to DIY enthusiasts and it is also good for the heat transfer between CPU and cooler. Thermaltake CPU cooler- TMG IA1 is equipped with blue eye-catching LED. Users can enjoy the performance and the attractive appearance. 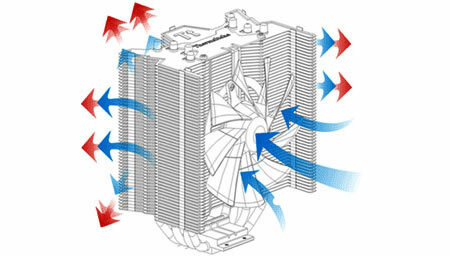 When the user does not need high performance, he can adjust fan speed to save more power and get more acoustic benefit. Thermaltake CPU cooler- TMG IA1 with approximately 30,000 Hours life expectation weighs 648g and is compatible with Intel (Socket LGA775) and AMD (Socket AM2).